Clothing Industry Training Authority (CITA) and Knitwear Innovation and Design Society (KIDS) are jointly organising an Overseas Training Programme to Japan on Lean Manufacturing Technology for Sweater Industry. The major purpose of the use of Lean Manufacturing Technology is to increase productivity, enhance the manufacturing cycle time, reduce inventory, and eliminate manufacturing waste; in other words, the cost can be minimised. Lean manufacturing technology is widely used on woven garment production with very good results. However, it is still new for sweater industry. To cope with the increasing competitive challenges in apparel industry, sweater manufacturers need to give up the traditional production way and to acquire up-to-date knowledge in technology advancement to ensure sustainability in their business. Japan is the first country that using Lean Technology on their manufacturing industry, and got extremely success to enhance their productivity efficient. 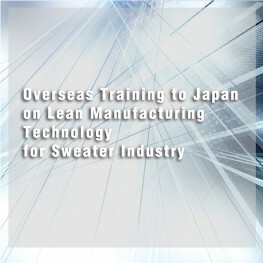 Towards this end, the Clothing Industry Training Authority (CITA) and Knitwear Innovation and Design Society (KIDS) are jointly organising an Overseas Training Programme to Japan on Lean Manufacturing Technology for Sweater Industry. The objective is to provide Hong Kong Sweater manufacturers an insight into the new technologies on the concepts and applications of Lean Manufacturing on sweater products and how they could be effectively applied to create value for both the company and customer. This intensive training programme will be held at Japan from 30 Nov to 04 Dec 2015. On a full cost recovery basis for 15 participants.